Thanksgiving is just around the corner and nail art fanatics are coming up with crazy amazing designs for acrylic and non-acrylic nails, but what if you don’t have time to make your nails look as perfect as theirs? What if you don’t have the same artistic skills? Well luckily for a quick and beautiful manicure fix there are things called decals. These are specifically made to go on your polished nails and give you those extra designs you want without the hassle. If you want some turkey inspired nails then look no further than the decals by Southern Country Nails. They have cute cartoon looking turkeys that aren’t just well done, but hilarious. Some of them are holding pies, utensils, and signs. These cute little decals are perfect for Thanksgiving. Kids and adults will love these decals and they come in a pack of 20. So you could save them for next year too or you could have a matching mani and pedi. What’s nice is that they are waterslide decals as well. Get them here for only 3.99. These next decals are for acrylic nails. They are farmhouse inspired nails for Thanksgiving and the Autumn season. They have beautiful yellow leaves, gorgeous juicy red apples, and chipmunks. They come in a set of 12 and are gorgeously affordable at only $15.99 for these stunning decals by Tempea. Get yours here. If you’re looking for some decals that are a mix of different parts of the Thanksgiving holiday then you should look at these nail art decals that are also by Southern Country Nails. Sticking with their same cute cartoon style they not only have turkeys in this pack of decals but tee-pees, cornucopias and more! This package comes in a set of 20 and they also make a great Thanksgiving gift too. Maybe you can do everyone’s nails on Thanksgiving eve and skip the movies. You can get these cute decals here for only 3.99. These Fall Charms water decal sliders by Whats Up Nails are perfect for an elegant and gorgeous Autumn look. They have beautiful burgundy and gold hues with a hint of metallic. Metallic nails are huge this year and burgundy and gold aren’t just Fall colors this year. Winter is loving those colors too. There are 12 water decals in each pack so you will have plenty for the winter season as well if you want to extend this gorgeous look. For $2.75 you can buy them here. These are perhaps my favorite nail decals on this list. These decals are also by Southern Country Nails (they have a lot of great Autumn and Thanksgiving looks), but while it has a hint of cartoonish style to them these decals are much more elegant and detailed. They are colorful leaves falling off of a tree and the tree itself. This set is so stunning and makes me happy every time I look at them I think it’s a must get for the Autumn and the Thanksgiving season. You can get them in a pack of 20 and another great point of Southern Country Nails is that their decals are all made in the USA. You know they are great quality. Go here and buy this pack for 3.99. Are you looking for some nail decals with things like pumpkin pies and pumpkins? Perhaps you want that gorgeous gourd to look for the Thanksgiving holiday coming up? Well again by Southern Country Nails these decals will blow your mind. They look like nails you would have to take hours to do with a stamping technique or stencil, but you don’t have to do any of that with these awesome decals. Again they are waterslide decals that come in a pack of 20 and are, of course, USA made. Go here to buy them for 6.99. They are more detailed so the price reflects that. Are you pumpkin crazy? Then these nail decals by What’s Up Nails are exactly what you need for your next manicure. 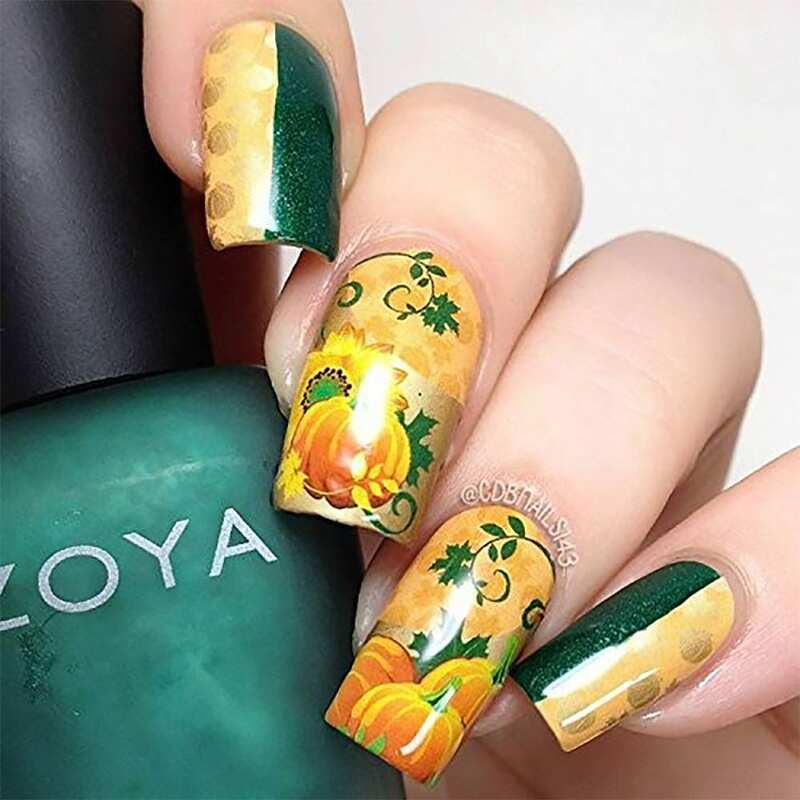 They have beautiful pumpkin detailing with the vines and look more elegant than the other nail decals with pumpkins on this list. For a sophisticated look, these are the waterslide decals you need to get. Oh, and they have a pop of metallic pumpkins patterned on the nails. You can get these beautiful nail art decals here for only $2.75. These next nail decals are super cute they not only have the usual pumpkins, leaves, and turkeys. This also incorporates pilgrims. One of the main reasons we have Thanksgiving today. So if you want a real homage to Thanksgiving these are the decals you need. They are instant nail designs and you don’t have to have acrylic nails to use these decals. You can put them on your natural nails or polished nails. The best part about these decals come with a sheet of 50. So you can go all out with a mani and pedi for Thanksgiving. They are made from the enigma Design Company and they cost $4.95.